A stunning mid Victorian compactum wardrobe comprising of a large arched central door, and two side doors with arched panels and flamed mahogany centres. The wardrobe opens up to reveal a beautiful satin lined interior with brass hanging rails and internally fitted drawers. The wardrobe is in lovely condition for its age, and breaks down into five sections for ease of transportation and reassembly. There is no significant damage to this piece of furniture; just general wear and tear. 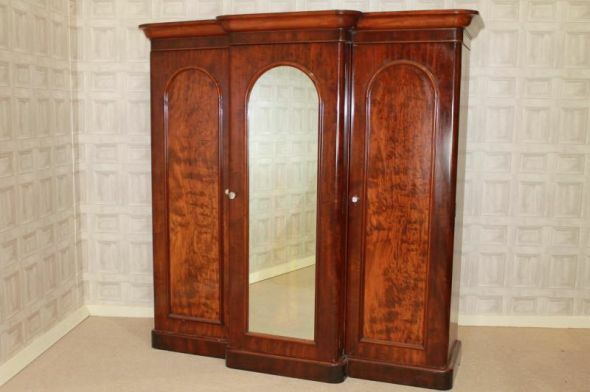 It is in a lovely rich chestnut colour, and would grace any period bedroom.